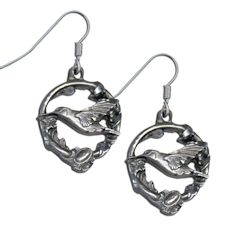 These hummingbird earrings are cast in 100% lead free fine pewter and have hypoalergenic french earwires. They are diamond cut for added sparkle. Each earring is approximately 3/4" in diameter. A matching hummingbird pendant and humminbird bracelet are sold separately.